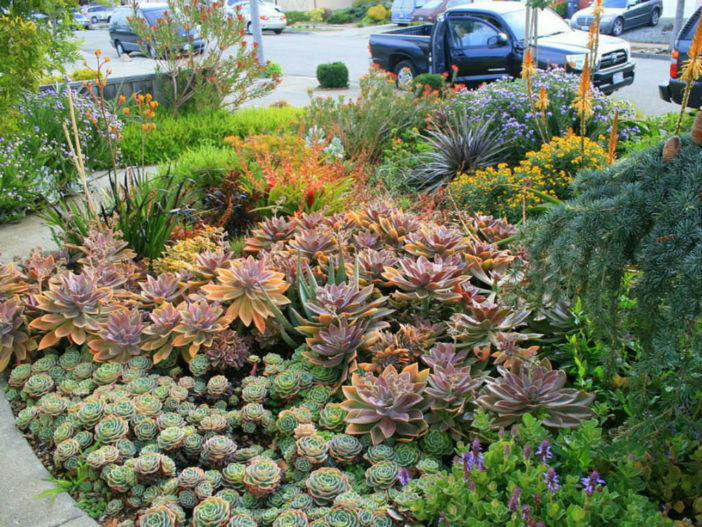 It is possible to include garden-quality outdoor succulent plants in any landscape, anywhere in the country. The unique but commonly-grown plants, which usually have fleshy leaves or plump stems or roots for storing water in dry seasons, come in a wide array of shapes, sizes, foliage colors, flowers, and often unique frills and bristles. And many can tolerate hard freezes. Use them as stunning single-use focal point plants, durable groundcovers for difficult slopes, patio accents, or grouped in colorful combinations. Some are suitable for living fences, brush fire defense, and even home-grown burglar protection. In-ground succulents can be combined with container-grown species for added emphasis, especially with those which may need moving seasonally out of adverse weather. There are three major considerations for growing succulents outdoors: Temperatures both winter and summer, amount and timing of natural rainfall, and duration and intensity of sunlight. Get around them all by choosing the right plants for your area, preparing soil for better drainage, and protecting some from hot mid-summer sun. Many popular garden succulents will tolerate mild freezes, even teens and lower, including certain Aloes and Senecios, Golden Barrel Cactus, Cholla (Cylindropuntia), Pincushion Cactus (Mammillaria). Echeveria, and Graptopetalum. At least half a dozen types, mainly certain species of Yucca, Agave, Sempervivum, Delosperma, Opuntia, and Sedum, can easily survive being left outdoors in USDA Zone 4 or 5, which can get to -30°F (-35°C). Also keeping container plants close to buildings will help protect borderline species from cold injury. Some extremely cold tolerant alpine succulents, including London Pride Saxifrage (Saxifraga × urbium) will simply melt in warm climates. In general, all succulents do best in sun; many will get leggy and weak without at least six hours of sun daily, and many get more colorful and flower better in eight or more hours of direct sun. Plants with colorful foliage tend to take more intense sun than green or variegated varieties. However, some will fade, spot, or even burn in the intense heat of full sun, especially in humid climates and when temperatures remain above 90°F (32°C) or so; these need to be shaded from mid-day and afternoon sun by buildings, lattice, arbors, shade cloth, or trees with light, fine-textured foliage. Succulents are able to tolerate dry conditions for a long time, but usually grow and flower better with regular watering during the active growing season. Though quite a few, including Opuntia, Yucca, Aloe, Echinocereus, Cylindropuntia, Mammillaria, Agave, and Delosperma, can survive in most arid or summer-dry parts of the country on rainfall alone, most will need watering at least every few weeks, often more in very hot areas. Still, too much water is worse than too little, so most gardeners keep outdoor succulents on the dry side during rainy weather, especially in winter, to both help reduce rot and help them survive lower temperatures; this may mean covering them from rain, or keeping them in pots to be moved under a protective porch roof. Plant as early in the season as possible to allow succulents to become established before winter, but be prepared to protect cold hardy kinds the first winter. In most cases, native soils and container soils alike will need amending with other materials to increase water drainage during rainy seasons. Add a little compost or other organic matter, and up to fifty percent total volume with coarse sand, pumice, grit, or kitty litter-like soil amendments used by professional turf managers to loosen soils. Till these into at least the top six or eight inches of native soil. Firm soil mix carefully as you plant, firming it as you go, and cover the area with coarse sand or gravel. Allow them to settle in for a day or two before watering, and fertilize lightly in the spring with a low-nitrogen garden fertilizer. And again, supplement in-ground succulents with container-grown ones, plus natural accents such as small boulders, gnarly driftwood, glass sculpture, or a section of fence made of weathered wood, adobe, or stone.